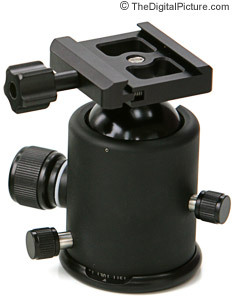 The Kirk BH-1 Ball Head is a very high quality ball head for general-purpose use. My inexpensive Bogen Manfrotto 3413QR Ball Head was struggling to hold my Canon EF 300mm f 4.0 L IS USM Lens (or Canon EF 70-200mm f/2.8 L IS USM Lens) and Canon Extender EF 1.4x II Tele-Converter, without slipping - I actually had to compensate for where the lens would settle after the ball head was locked. After turning the thumb lock (tight enough to cause very sore thumbs), the lens/camera combination would settle somewhere well below where I originally aimed. Upgrading to the Kirk BH-1 Ball Head really made a huge difference. A nice ballhead makes me more inclined to use a tripod for some shots I would have previously tried to make without. Put a quick-release body plate or lens plate on your camera or tripod collar and tighten them into the BH-1's universal Arca-Swiss style quick release clamp and nothing moves. Adjustments are smooth to make and immobile when tightened. The main tension thumbscrew effortlessly locks the BH-1 into place. A smaller thumbscrew on the side adjusts the friction on the BH-1 when the main thumbscrew is loosened. An additional thumbscrew on the bottom allows indexed 360 degree panning-only adjustments (the index is especially useful for taking panoramic photos). The Kirk BH-1 Ball Head is functionally a very good ballhead. My biggest issue with the BH-1 is that I occassionally/accidentally (usually in the dark or while looking through the viewfinder) adjust the friction knob instead of the panoramic knob as they are similarly sized. It generally is not a big deal - just an inconvenience. As for capacity, it did not have a problem with my Canon EF 500mm f/4 L USM Super Telephoto Lens mounted on a Wimberley Sidekick. Weighing about 2 lbs, The BH-1 features good build quality. According to Kirk Enterprises, "All external components are crafted from tough 6061-T aircraft aluminum including the solid, captive-design knobs, and the internal metal parts are stainless steel and brass to avoid corrosion. The ballcup is produced from self-lubricating Delrin composite, and the tripod socket accepts 3/8-inch thread." The clamp thumbscrew captive (does not turn off). The matte finish is not my favorite as it marks easily when something gets against it (fingernails, branches ...). It is, however, not reflective in bright sun (wildlife photographers will understand the value of this). These marks come off - the finish is not easily damaged. Another slightly negative issue is that the clamp thumbscrew can hit the main tension thumbscrew if angled just right. This is not a big problem - just another minor differentiator. The bottom line? The Kirk BH-1 Ball Head is currently one of the best ballheads. 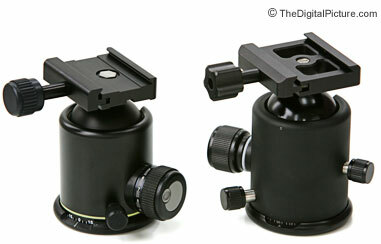 I am currently using a smaller and higher quality head - the Arca-Swiss Monoball Z1 Ballhead. Pictured below is the Arca-Swiss Monoball B1 Ballhead (left) beside the Kirk BH-1.